All proceeds go to the Emory Douglas Youth and Family Art Program, a project of Feedom Freedom that we are proud to support. The short film Emory Douglas: The Art of the Black Panthers and the featureThe Eyes of the Rainbow are included. Refreshments will be served. Tickets are $25 and are available at the box office during business hours or online here. Made possible with the support of Black Lives Matter, the Charles Wright Museum, and the James Pearson Duffy Department of Art and Art History at Wayne State University. Russia, 1953: The mood under Stalin's regime is one of rampant paranoia. Spouses inform on one another, the secret police are always listening, and death squads roam the streets executing "traitors." One morning, the dictator is found comatose after a massive stroke, triggering a deadly power grab among his closest sycophants and confidants. 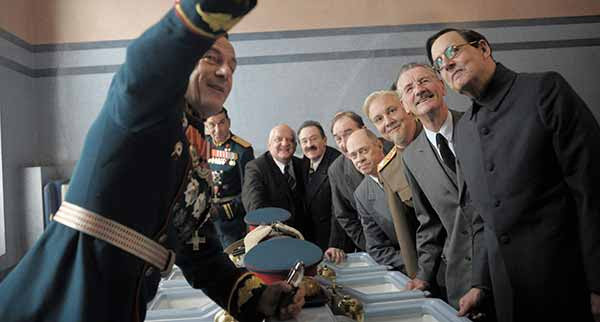 Who will take power after The Death of Stalin? An infamous war criminal and former General is moved to a new hideout, where he forms a relationship with his only connection to the outside world – his maid. Starring Ben Kingsley, Hera Hilmar, and Peter Serafinowicz. Tickets are now on sale for Wes Anderson's Isle of Dogs, which starts Friday, April 20. It's about Atari Kobayashi, 12-year-old ward of the corrupt Mayor Kobayashi. When, by Executive Decree, all the canine pets of Megasaki City are exiled to a vast garbage-dump, Atari sets off alone in a miniature Junior-Turbo Prop and flies to Trash Island in search of his bodyguard-dog, Spots. There, with the assistance of a pack of newly-found mongrel friends, he begins an epic journey that will decide the fate and future of the entire Prefecture. Bill Murray, Jeff Goldblum, Kunichi Nomura, Akira Takayama, Greta Gerwig, Frances McDormand, Akira Ito, Scarlett Johansson, Harvey Keitel, F. Murray Abraham, Yoko Ono, Tilda Swinton, Ken Watanabe, Mari Natsuki, Fisher Stevens, Nijirô Murakami, Liev Schreiber, and Courtney B. Vance. Fri, April 20: 5:00 | 7:00 | 9:00 p.m.
Rev. Fred Lane, the pants-­less, Band Aid­-adorned performer who achieved a worldwide cult following, starting in the Eighties on college radio, when the Shimmy Disc label made Lane’s records easier to find. Rev. Lane is described by his obsessed fans as “subversive,” “completely satirical,” “the Dada Duke Ellington,” and “Demon Frank Sinatra.” They've spent years examining every detail of his albums, only to be led deeper into blissful confusion. Icepick to the Moon pulls the curtain back on both the cult of Lane and the mysterious artist himself, from his early involvement with the Raudelunas arts collective to his current occupation making whirligigs to sell on the arts and crafts show circuit. You’ve never seen Lane like this! Director Skizz Cyzyk (above right) will be in town to play with Mink Stole’s band and will be with us in person for a Q & A after the show. Who knows, you may meet some very special guests! If you’re reading this on your phone, thank Hedy! Hedy Lamarr, the screen siren deemed “the most beautiful woman in the world” in the 1930s and ’40s. also invented a form of wireless communication called “frequency hopping” that revolutionized mobile communications all over the world. This feat would directly lead to the creation of secure communications for wireless phones, Bluetooth, GPS, and WiFi technology itself. And that’s just a fraction of her amazing story. and finally, Hedy’s influential U.S. feature debut, Algiers (1938). Tickets are $15 are available at the box office or online at bit.ly/thankhedy. Part of the 20th Annual Lenore Marwil Detroit Jewish Film Festival presented by JCC of Metro Detroit. Following their Lovecraftian cult classic Spring, acclaimed filmmakers Moorhead and Benson return with The Endless. This mind-bending thriller follows two brothers who receive a cryptic video message that inspires them to revisit the UFO death cult they escaped a decade earlier. Hoping to find the closure that they couldn’t as young men, they’re forced to reconsider the cult’s beliefs when confronted with unexplainable phenomena surrounding the camp. As the members prepare for the coming of a mysterious event, the brothers race to unravel the seemingly impossible truth before their lives become permanently entangled with the cult. Bill Murray, Jan Vogler and Friends giveaway.